Oftentimes, it's difficult to know exactly how to treat your lawn so that everything is green and healthy. It can be very inconvenient and frustrating to do it yourself. 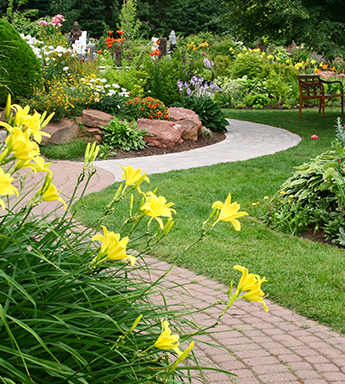 Let McGuire Services, LLC provide you with the custom lawn care your property needs. Prices for our customized services are based on square footage. We would be happy to provide a free lawn analysis and price quote today! Your lawn will receive 6 balanced feedings throughout the growing season to promote a thick green, healthy lawn. This includes winterizer for the health and durability of your lawn over the winter. Each feeding is formulated for the seasonal needs of the grass plants. Crabgrass preventative will be included with your spring applications. This will provide a barrier against the emergence of crabgrass. It helps to insure that crab grass will not be a problem throughout the year. We will monitor your lawn for broadleaf weeds such as dandelion, clover and more than 50 other common lawn weeds throughout the growing season and treat as needed to insure a weed free lawn. 48 hour service calls are included with our program at no extra charge. If weeds come up in between applications, or if you would like to consult with us for any reason, simply give us a call and we will return to your property within 48 hours to resolve your concerns. We tend to have very acidic soil here in the Northeast. Lime will help to neutralize the pH levels in the soil so that your lawn can maximize the efficiency of the fertilizers which are applied. Lime is an important component of any good turf management program in Connecticut and Massachusetts. Core Aeration relieves soil compaction and helps control thatch build-up. Done in the late summer, early fall, it improves the flow of air, water, and nutrients into the root zone. At the same time, we overseed your entire lawn. It's one of the best ways to get a healthy, thick, green lawn. Grubs feed on the grass roots and can destroy a lawn without notice. Our quality grub prevention service is done at the optimal to protect your lawn from the damage white grubs can cause. With strength in numbers and voracious appetites, surface feeding insects can devastate your property. Get rid of a wide variety of surface feeding insects such as chinch bugs, bill bugs and sod webworms with our surface feeding insect control. Perfect for those who have pets or concerns about the spread of Lyme disease, this service will control the tick population on your property. Protect your family from risk with this service. If you're concerned about other pests or mosquitoes, we have a service for that as well.